I’ve always been one for anything sport, outdoors and water. 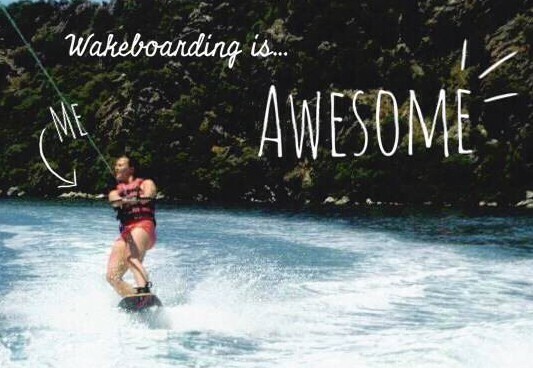 So wakeboarding is pretty much made for me. I first gave it a go in Turkey on a Neilson holiday, which is where I met the love of my life (vom). As it was new to me, and I had never snowboarded either, the instructors there told me to have a go at water-skiing first. I told them where to stick that suggestion. Once I was all strapped into the giant boots and dropped into the tepid waters, they had me try out standing up whilst holding a big metal pole which was fixed to the side of the boat (so you didn’t wobble about too much). That seemed fairly straight forward, so it was then onto the rope. It’s a bizarre feeling being stuck in the sea with your feet strapped to a massive board which floats, so you are sort of bobbing on your back. I must have looked a bit like a dead ant. Anyhow, as the boat begins to move the rope loses its slack and you have to hold on to the handle for dear life. You bring your knees right up to your chest and use the force of the board against the water to ease yourself up. Despite the inevitable falls, I loved every ride and had such good intentions to do more of it when I got back to the UK. That holiday was over two years ago, and how many times have I been wakeboarding since? The grand total of ZERO. THIS MAKES NO SENSE. Why, when I find something I love, do I not do more of it? This is a serious life problem which I intend to address. To my delight, I heard a few months back that a wakeboarding park was to open in Cardiff Bay, but this is yet to emerge. The latest news is that it will be open March 2015. In the meantime, Penarth Waterski and Wakeboard Club may be the solution. I can’t see much from the website but watch this space. I’ll be getting my little size fives into those gigantic boots again soon! And fingers crossed I elude the dreaded faceplant.